With power up by 90bhp and weight down by 70kgs, Porsche has unveiled its fastest and most powerful road car ever. According to the German sports car company, the GT2 RS marks the 'summit' in the 911 range. It delivers a maximum power output of 611bhp and it weighs just 1,370kgs. That gives it a weight-to-power ratio of just 2.21 kilos per horsepower - the best power/weight ratio in its class. Although you could not begin to call this car 'green', fuel consumption and CO2 emissions are down by about 5% over the 'standard' 911 GT2. The RS will return an average fuel consumption of 23.7mpg and emit 284 g/km of CO2. It's powered by a six-cylinder boxer engine with two turbochargers, variable turbine geometry with a six-speed manual gearbox. Massive, specially developed tyres have been fitted in a bid to increase traction. The 325/30 ZR 19s help to take the car from 0-62mph in 3.5 seconds, from 0-124mph in 9.8 seconds and 0-186mph in 28.9 seconds. Composite ceramic brakes are fitted as standard and the RS also features longitudinal and lateral dynamic chassis control. In a bid to help handling and safety Porsche's Adaptive Suspension Management and Porsche Stability Management are included. Exterior-wise, carbon-fibre-reinforced components with a matt-black finish have been added to set it apart from the standard 911 GT2. At the front the new, wider 911 GT2-style light-alloy wheels with centre locking are encircled by flared wheel arches. The RS also features GT2 RS model designations on the doors and rear engine cover. The upgraded front spoiler lip and the rear spoiler lip are also made of reinforced carbon-fibre and the rear spoiler lip is now 10 millimetres higher to ensure the right aerodynamic precision, as well as extra downforce. 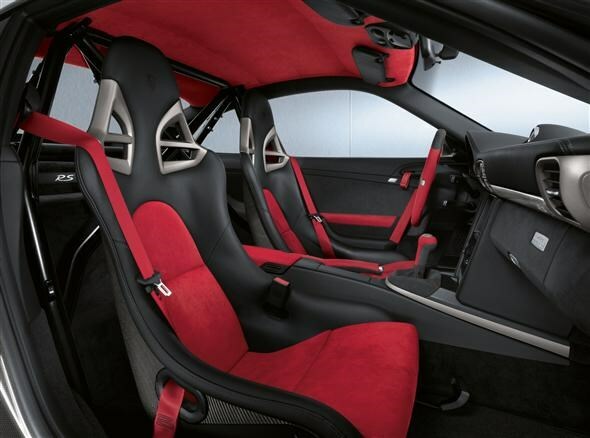 Inside, the RS gets lightweight bucket seats made of carbon-fibre-reinforced plastic with lightweight interior door panels and door opening straps. The basic interior colour is black with contrasting red alcantara upholstery on the seat centre sections and the roof lining as well as segments on the steering wheel rim, gearshift and handbrake lever. The RS is due to make its debut at the Moscow Motor Show in August this year. It is limited to just 500 units worldwide and will be available to UK customers from September 2010 priced from £164,107.